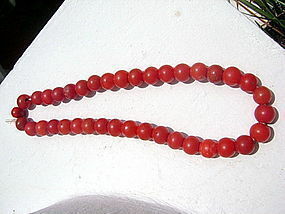 A strand of 30 genuine ancient fiery red carnelian beads from India-Himalaya, 1000 - 2000 years old. Average diameter measures 16.5 mm. Some beads manifest tiny holes, only 4 beads show some cracks due to the considerable age/wear, overall in very good condition. These beads come from the estate of a serious bead collector. Will consider selling individual beads upon request. 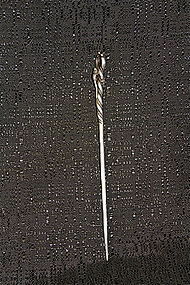 Perfect for jewelry design projects or for adding to a necklace/bead collection. 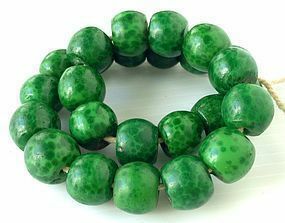 Much sought after/rare genuine antique Peking Glass Green Leopard Guru Beads. 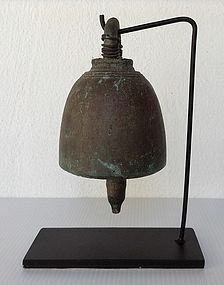 QING Dynasty, approximately 200 years old. 32 beads available measuring 12-13 mm. each in diameter. From the estate of a serious bead collector. These exquisite beads are dark clear green on a light green uniform background and in very good condition (no cracks or chips whatsoever). Will consider selling individual beads on good offers. 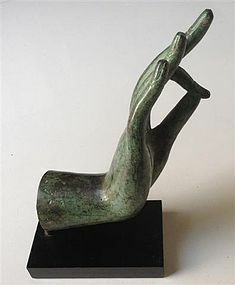 A nicely mounted and rare antique Thai Ayuthaya bronze hand of Buddha symbolizing fearlessness and protection. 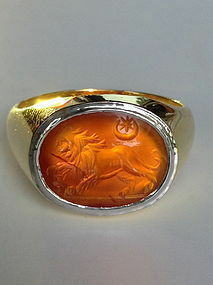 There is a lotus flower in the palm representing good fortune and purification of the spirit. 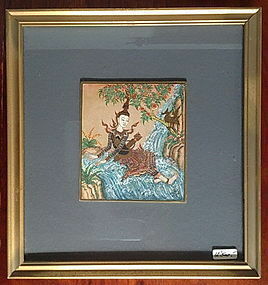 Large size: H. 25 cm. x L. 25 cm. x W, 9.5 cm including stand. Good condition. 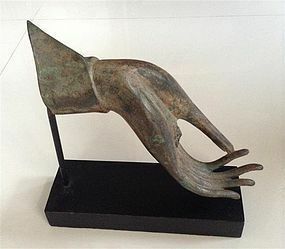 A beautiful antique Thai Bronze Hand of Buddha mounted. Nice verdigris patina, good condition. 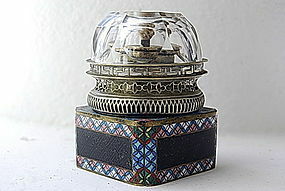 Size including stand: H. 17 cm. x L. 9 cm. 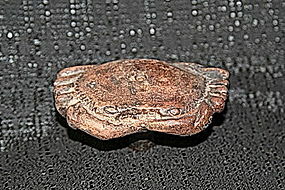 x W. 5 cm. Fingers up and palm facing outwards symbolizes fearlessness and protection. 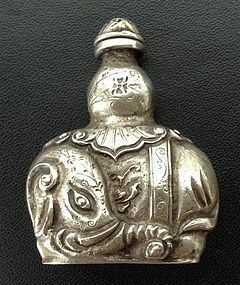 A very attractive 19th Century silver snuff bottle in the shape of an elaborate elephant with a beautiful saddle and floral decor. This snuff bottle comes with it's original stopper with spoon. Base has Chinese character markings. Very good condition, no repairs or cracks. Size: H. 5.5 cm. 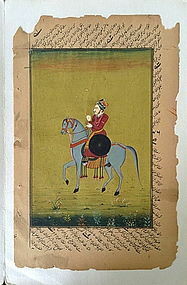 x W. 4.5 cm. x D. 2 cm. An attractive 22K. 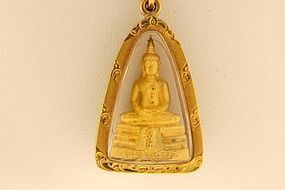 Yellow Gold Thai Buddha Amulet with Gold Framed Casing and a 14K. Yellow Gold Chain. Pendant hangs approximately 1.5" down from 18" chain. 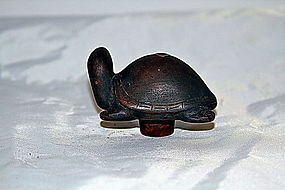 weight: 10.9 gr. 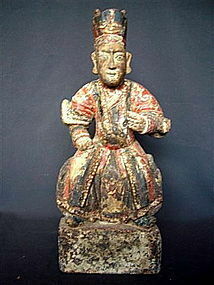 Provenance: Somdet Pra, Wat Yo Sothorn, Chachoengsao.